This review is of the cut shown at the BFI London Film Festival in October 2018 – the UK release date is currently listed for January 25th 2019. It’s hard to imagine these days, but there was a time when a scandalous love affair was actually able to derail an entire career in US politics; nowadays, it seems that most people – including sitting Presidents – can be accused of multiple infidelities and several cases of sexual assault, and nobody in a position of power seems to care. But in 1988, when Senator Gary Hart saw his entire Presidential campaign crumble into pieces over that very thing, people definitely cared a hell of a lot more than they probably would right now, which just goes to show how low the bar has been dropped thirty years on, but that’s a discussion for another time. 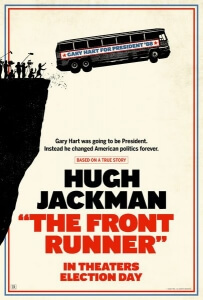 In the case of Jason Reitman’s The Front Runner, which covers all the major events surrounding the scandal, it’s very clear as to why it was made now, when both politics and sexual accusations are major talking points in the news, but Reitman ultimately can’t seem to settle on what kind of point he wants to actually show with this film, rendering it a slight and meandering movie that just wants to give us the facts, and nothing else. The film depicts the scandal over the course of three weeks, which start with Hart (Hugh Jackman) gaining an immense lead in the race to become the 1988 Democratic Presidential candidate, and seemingly nothing getting in the way of his frontrunner position. That is, until reporters at The Miami Herald receive a tip that Hart has been seen with young blonde Donna Rice (Sara Paxton) coming in and out of his home in Washington D.C., and after accosting an angry Hart outside his house they run a story that Hart has been having an affair with the young woman, which puts Hart, his wife Lee (Vera Farmiga), his daughter Andrea (Kaitlyn Dever) and his entire campaign team under heavy spotlight by the hungry media. We see it all unfold from many angles, including from Hart and his family personally, the reporters who break the story, other reporters at The Washington Post and those travelling with Hart along the campaign trail, the campaign team led by J.K. Simmons’ Bill Dixon, and even how Rice herself is babysat by a female member of Hart’s team. The movie Vantage Point didn’t have this many vantage points, and it kind of leads into one of the film’s problems, in that there’s quite a lot going on yet there really is no major focal point. You don’t really know which one of the multiple plot lines in this we are meant to identify as the one we’re supposed to be following the most, because it cuts back and forth so many times from one plot to another that it makes itself seem very unfocused and dramatically all over the place. Reitman, who usually is savvy with finding a focal point in one of his films and developing everything from there, can’t quite seem to find the best angle from which to tell this story, and I admire him for trying to show different perspectives of the whole ordeal but when it’s this many, it has the ability to meander far more than it should. It also boils down to how, when you really take the whole thing apart and analyse all its pieces, this really isn’t a whole lot you can do with it to make it a worthwhile theatrical experience. That’s not to say that nothing interesting can come from a story like this in a movie, but Reitman gives it a very routine feel that heavily features scenes of people sat in rooms talking to each other, occasionally raising their voice for dramatic effect, but rarely saying or doing anything that really screams excitement on the big screen. I think if this film had been made around four years ago, when US politics was still seen as somewhat respectable, maybe it could have had a bigger impact; unfortunately, seeing how the truth is far stranger than fiction nowadays, suddenly a movie surrounding a US politician having an extramarital affair doesn’t seem as shocking as what’s going on in the White House right now. The movie doesn’t have much to say about why Hart did what he did, or even the impact it would have on his later career down the line; instead, this movie is dedicated to just giving us the cold, hard facts of the case like a docudrama, which would make for an interesting documentary but not exactly the most enthralling movie-going experience. I wish I liked this film more than I did, because most of the things I’ve seen Reitman do I really liked (except for Men, Women and Children, which is still his worst film to date), and when you have great actors like Hugh Jackman and J.K. Simmons on board you can expect them to do some solid work here, which they do, but at the end I couldn’t help that this was a slightly wasted opportunity to really say something in an era where politics in America is dominating the news for all the wrong reasons. There could have been so much more to this film, especially with it being positioned as a potential awards contender, but like Gary Hart itself there are just too many flaws to it that derail its chances at potential glory. The Front Runner is a well-intentioned but ultimately slight political drama which, despite solid performances from a cast that includes Hugh Jackman and J.K. Simmons, never finds its footing or anything worthwhile to say.